I am thrilled to announce I'll be hosting a seminar on leveraging social media to boost business development efforts and results. This seminar is made possible by one of my clients/partners, IQuest Concepts, LLC, and will be held at the National Entrepreneur Center: African American Chamber of Commerce of Central Florida - located at 3201 E Colonial Drive, Suite A-20 | Orlando Fashion Square (covered parking by JC Penney & Sears). In this seminar, I'm not only going to acquaint you with the world of social media, but we will also go over how to build a social media marketing strategy. My goal is to make social media marketing less intimidating for small business owners, and to show the power of building a strategy and managing a campaign. We will lunch, learn, and share successes and challenges when it comes to implementing and managing social media as a sales and marketing tool. 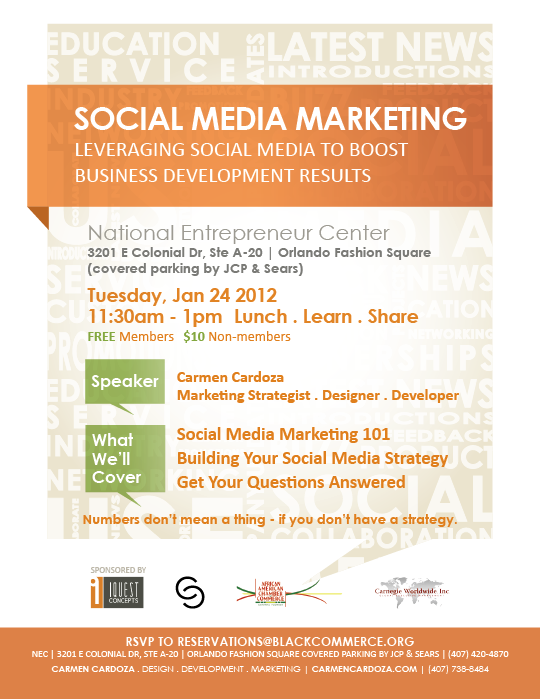 This seminar will be held on Tuesday, January 24, 2012 from 11:30am to 1pm. If you live in the Central Florida area and would like to participate, please RSVP to Reservations@BlackCommerce.org. If you have any questions regarding the seminar, shoot me an email.